What does a block captain do? Probably less than one hour each month in addition to the neighborhood general meetings. What is a block captain’s term? We’re hoping you’ll be a block captain as long as you live in the neighborhood, but all things change and life can get complicated. If you find you are unable to continue your duties, try to find a replacement but just let Deb Hudson know so there isn’t a gap in communications. 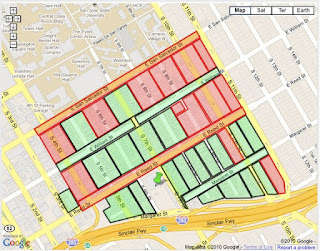 The neighborhood is divided into blocks that each have a block captain. Click on the map below to see who the block captain is. Red blocks don't have a captain. Please volunteer if you live on one of them. Who are the block captains? Here is a list of our current block captains and their blocks as well as estimated numbers of fliers you may need. Don’t hesitate to recruit other neighbors or take on another small stretch to help fill the gaps! Call if you need more or fewer fliers.